On Wednesday, I leave for 2 weeks in Paris. I have been planning this trip for over a year and I am extremely excited (an understatement). I am traveling with my sister and my BFF so I know we will have a great time. We are bringing art supplies, but have tried to keep things to a minimum. My BFF kept her supplies confined to a cigar box, with just a few items flowing over (paper, brushes, etc.) 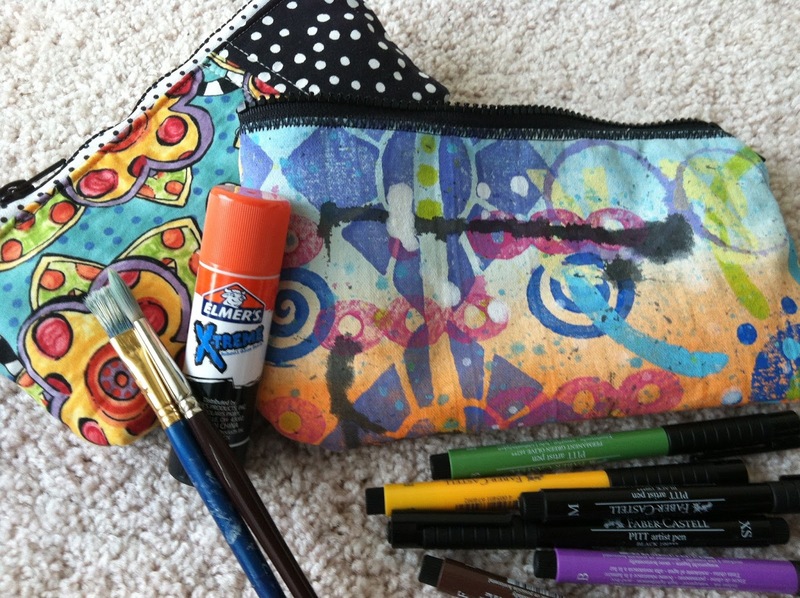 I decided to just carry items separately, but I did have to quickly sew a zippered pouch. I used some painted canvas that I had lying around (thank you, Alyssa Burke, for the inspiration). Here are the items that I am packing. I am bringing pens and pencils, of course. I just bought a pack of Faber-Castell Pitt pens (brush tip) in 6 different colors. I also bought a brown fine tip because I seem to always "wish" I had a good brown pen. Elmer's Extreme is my favorite glue, so that is coming on the trip. The brushes are coming because I am bringing a tiny bit of gesso and matte medium as well as . . .
. . . watercolors. 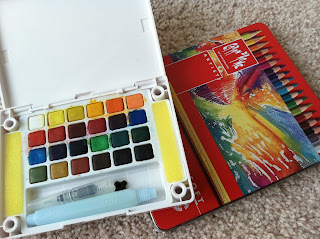 I have a travel watercolor kit made by Koi which has never actually travelled with me before. 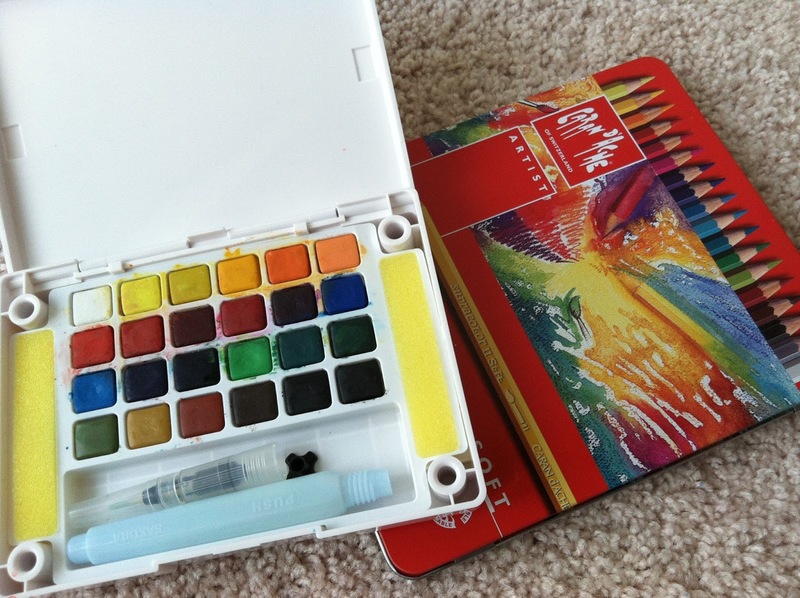 I am also taking colored (watercolor) pencils. I mustn't forget to pack the pencil sharpener. 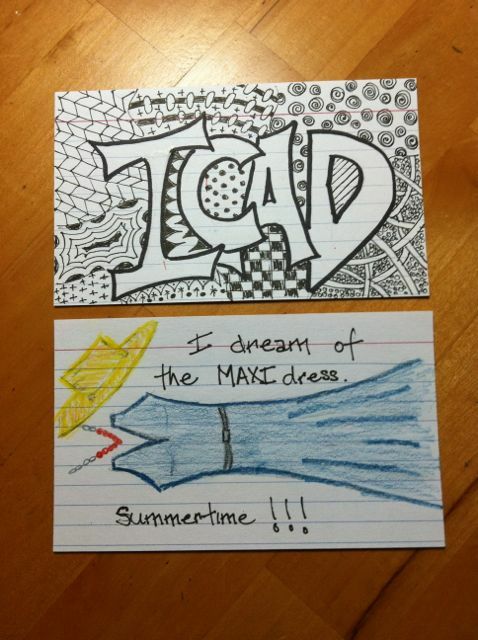 As well as bits of watercolor paper, I am bringing index cards to continue my ICAD participation. 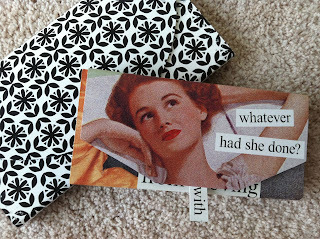 In a creative burst, I decided to make my own index card holder. I used an old calendar and it turned out beautifully. So beautiful, in fact, that I couldn't bear to have it smashed in my luggage, so I bought a plastic one for a dollar at Target (the black and white one). Hopefully I have all the necessities. 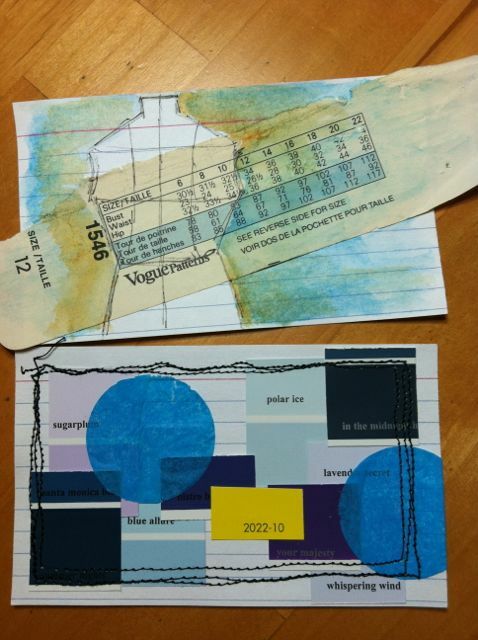 I am sure we will visit an art store in Paris where I will buy something wonderful to bring home. 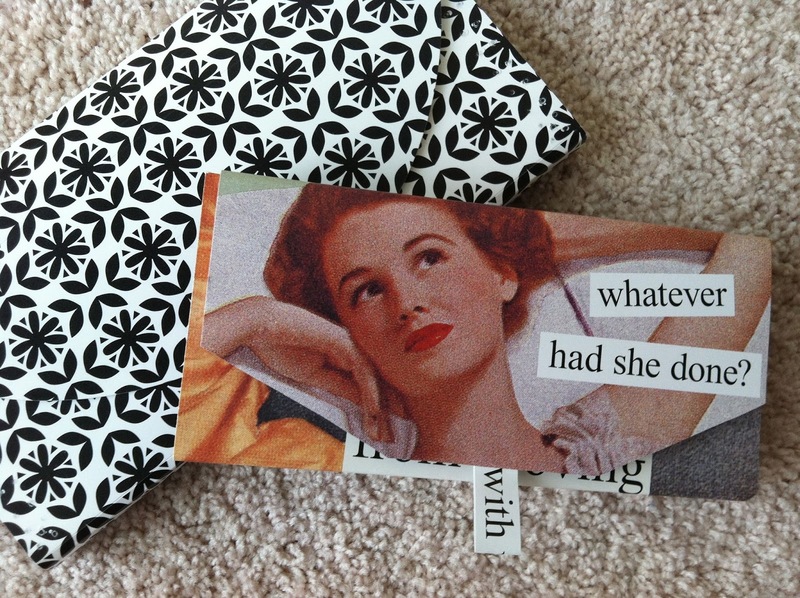 And I hope to create a proper art journal to document the entire trip. See you in August. Au revoir. 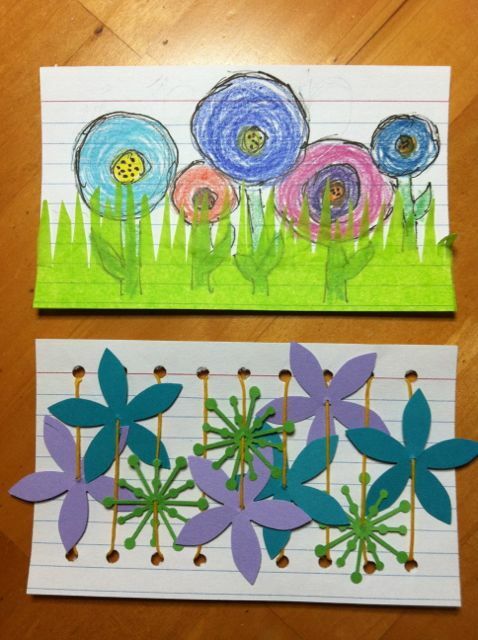 I am once again participating in ICAD (Index Card a Day) along with Tammy at Daisy Yellow. It is going on all summer long - 61 days. I know that I will not produce 61 index cards, but I enjoy the challenge of making 1 piece every day. 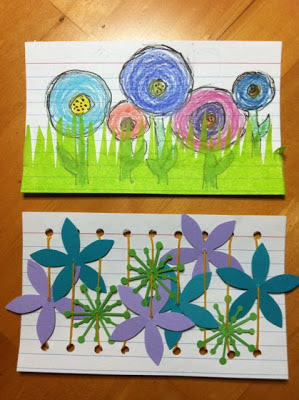 Here are some of my cards so far. 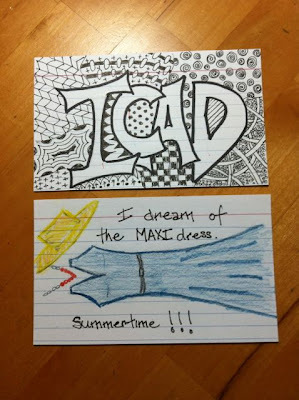 You can join the ICAD group at any time or you can just visit Tammy's website to view her work) as well as a Flickr group). What will you create today?